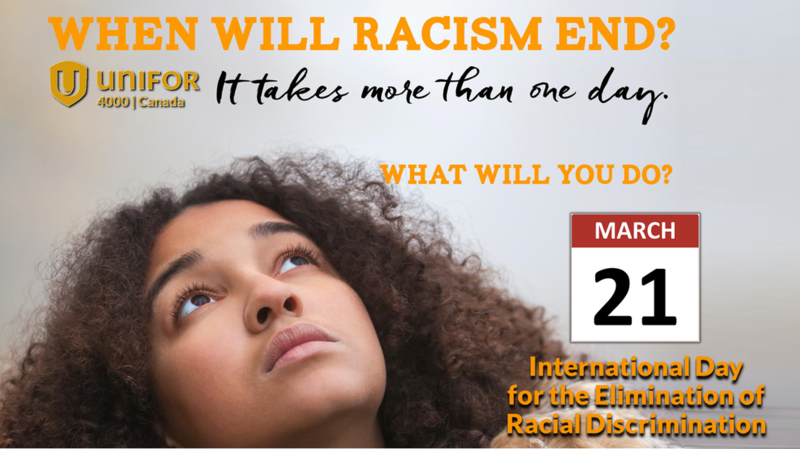 On March 21st, people around the world celebrate the International Day for the Elimination of Racial Discrimination. Recognition of the importance of eradicating racial discrimination and the social, economic, political and cultural damage caused by racism, xenophobia and bigotry remain central to the fight for social justice for all people. If we are to build a better world, one in which we demonstrate a commitment to justice, equity and inclusion, we must learn the lessons of our history. We must examine the role of the State, its institutions and ourselves in creating, perpetuating and upholding systems, assumptions and beliefs that exclude others from opportunity, security and equality. Canada is diverse and it is peaceful, but examples of discrimination, both historic and recent, mar our image and our ideals. Canada’s ongoing maltreatment of its Indigenous populations are just one example. The United Nations has repeatedly, and rightly, observed that Indigenous peoples in Canada live in third world conditions with high unemployment, mass poverty, high suicide rates, sub-standard housing and a lack of infrastructure. The Truth and Reconciliation Commission echoed these concerns and further noted that Indigenous women face these obstacles along with the added burdens of violence and abuse. The numbers of missing and murdered indigenous women in Canada is staggering. Our delayed response to this crisis ant those facing Indigenous people generally, must be considered through a lens of discrimination because only then will we get to the root causes. Absent that, there will be no reconciliation. Racism is ugly, it is harmful and its roots are deep and insidious. To combat it we must be willing to be uncomfortable and committed to examining our attitudes, our behaviour and our choices. Trade unionists have long been clear that dividing workers weakens them and gives power to employers. If we are to continue to build a strong, diverse and inclusive labour movement, we must support, encourage and strengthen participation of all workers, including racialized workers. We must make room for all voices and their experiences in our governance structures, in our policy initiatives and in our workplaces. We must teach future generations that tolerance isn’t enough; that acceptance of difference strengthens, not weakens, us. We must stand together every day, not just on March 21st. ​When we stand together in true solidarity, we will have answered the question, “when will racism end?”. It is our genuine hope that concerted, ongoing and committed efforts, will lead to the day where our children and their children will not know racism as a part of their lived experience. We can and should aspire to such a day. Unifor National Council 4000 is committed to working with all its members and Locals to eliminate racism from within the Union, our work places and within our communities.